Was man zu Weihnachten nicht alles aus dem fernen Deutschland erhält! Bei einer jährlichen Paketaktion mit einer guten Freundin habe ich nun die Möglichkeit erhalten, weit in die Kindheit zurück zu reisen. "Der kleine Vampir verreist", das dritte Buch von Angela Sommer-Bodenburg um Vampir Rüdiger (was für ein Name!) und sein "normaler" Freund Anton, ist eine kurzweilige Geschichte um die Wirrungen einer Zugreise mit einem Untoten.Natürlich bin ich nicht mehr ganz in der Zielgruppe, darum ist die Bewertung dieses kurzen Buches eher zweitrangig, trotzdem fühlte ich mich gut unterhalten und einige Stellen waren sehr witzig. Natürlich aber lebt "Der kleine Vampir verreist" immer wieder von Klischees und endet da, wo es für mich eigentlich wahrlich spannend werden würde – beim Urlaub. Als Abwechslung aber wunderbar frisch, trotz der vielen Jahre. In the middle of blood, guts, and strange encounters of the spirit world, I thought I'd take a break from my usual Halloween diet and read something light. The Little Vampire series has been my favorite since I was a kid, and I figured October would be the perfect month to continue with the series.Rüdiger, a vampire who's scared of the dark and loves reading vampire stories, has settled back into the vault he was banished from in the previous installment, but now he's once again gotten himself into a bit of a jam. He needs to avoid a guest who's been invited for a visit in his family vault, but luckily reluctant Anton is going to the countryside for a holiday with his parents, and Anton invites Rüdiger to keep him company.For me, the appeal of the series is seeing how differently vampires live compared to humans, and the little sparks of suspense when the friends face difficulties. Here, Anton gets to spend a so called vampire day by jumping on coffins and drinking spoilt cocoa. Before the holiday begins, though, he and Rüdiger take Rüdiger's coffin to the cottage by train, but they need to keep an eye on the old lady who shares their compartment, in case she finds her glasses and sees she's sitting opposite a real vampire. Again, Anton's parents are oblivious to what their son is up to when they're out of the house or when they're sleeping!Aunt Dorothee, on the other hand, is again a constant danger to Anton. Even when she doesn't appear in the flesh, she's still usually mentioned several times in passing in the books and gets to be a kind of villain who might jump (or fly) out of the shadows at any given moment. This makes the nightly excursions slightly creepy, so despite there being cute or funny stuff happening, you won't forget these are vampires who feed on humans. Then again, it never gets too scary, so Aunt Dorothee feeding on drunk people and getting an alcohol poisoning is just a source of amusement. De niña, nunca supe de la existencia de esta serie. Así que ahora me pongo al corriente y de los tres libros que he leído de la serie, hasta ahora es el que mas me ha gustado.Jajajajajaja Ay ese Anton! Que no acaba para disgustos con Rüdiger. A dodici anni, Soobie scriveva:Terzo libro della saga. Si svolge prevalentemente in treno perché Anton a [sic] chiesto a Rüdiger di accompagnarlo per una vacanza a due. Si parla del motivetto "È ritornato maggio al canto del cucù". Bel libro. Questo volume mi ha fatto morire, ahaha!E la scena del Vampiversario è qualcosa di.. Qualcosa di.. LOL, ecco! !Lumpi è un mito ahahah!! I'd like to read it, and I think it would be great.I've seen its movie, and I have "Little Vampire In Danger".I like it. Bellissimo come sempre! Spero di ritrovare anche gli altri libri della serie. Angela Sommer-Bodenburg - Angela Sommer-Bodenburg is the author of a number of fantasy books for children. 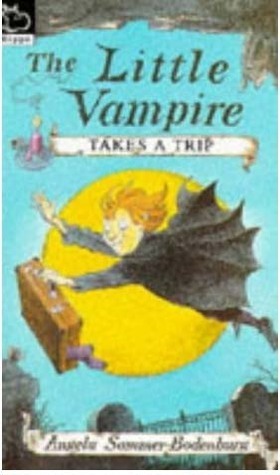 Her most famous contribution to the field of children's fantasy is "The Little Vampire" series which has sold over 10 million copies and has been translated into over 30 languages. Sommer-Bodenburg states that her "vampire is not a bloodthirsty monster, however, but an affectionate little vampire with fears and foibles who will perhaps help free children of their own fears." The novel, written in 1979, spawned a series of books, and the plot has been adapted to theatre, radio, cinema, and television. A Canadian-German TV series was released in 1986 and a film version, directed by Uli Edel was released in 2000.